I’ll admit, satellite tracking does not have the same ring it did 10 years ago. Today, it is everywhere. With the smallest of units in our car or smartphones, we can have our daily paths followed from space and even invite others to know where we are at all times, all with the touch of a screen. But for following animals in a very large ocean, satellite tracking is powerful and exciting, and believe me, it does not just happen with the touch of a screen! Using this everyday technology, we researchers watch and wait, thousands of kilometres away in our office for information on the movements of tagged animals as they swim their way across our oceans via space. 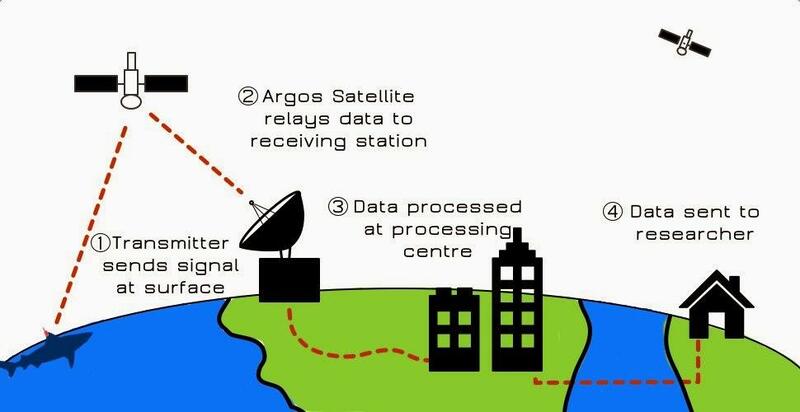 Briefly, satellite tracking (aka telemetry) works using a tag/transmitter capable of sending an identifying signal to satellites. In our work, we use the Argos network. These satellites, cruising around earth about 850km above us, receive the signal then relay the information to receiving stations back here on earth. The information is then processed and made available to us, the researchers. 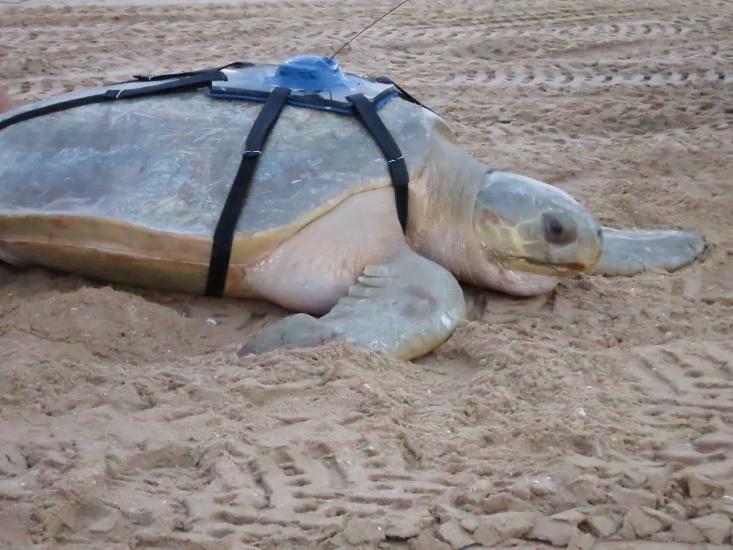 Satellite tracking is truly global in nature, and is useful for collecting data as both marine and terrestrial animals move large distances, over thousands of kilometres, for long periods. 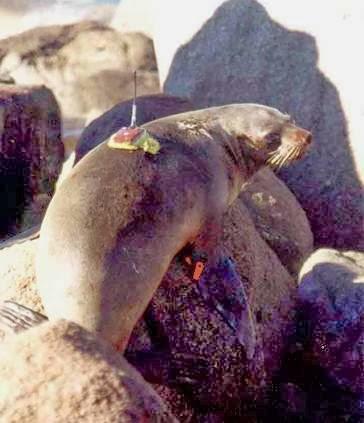 In the case of marine animals, the tagged animal needs to break the surface regularly so the transmitter can send a signal to satellites – transmission cannot occur through water. For whales, seals and turtles that regularly visit the surface to breathe, this method is great. However, we can also use them on some shark species whose dorsal fins (that’s the famous fin on the back of the shark) occasionally break the sea surface, such as tiger sharks. 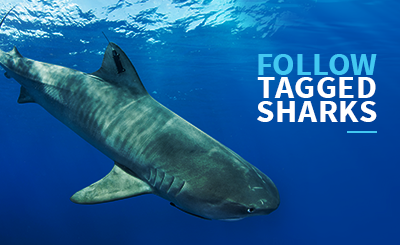 For these sharks, we attach the tag to the fin. Check out the map showing the movements of some of the animals we have tagged and Ocearch. How long we can follow an animal comes down to (assuming everything else goes to plan) how long the battery lasts. This depends on the size of the tag itself (which dictates battery size) and how much the tag pings. The more it pings the faster the battery loses power. For sharks, we expect to receive signals for over a year. Unfortunately there are other factors that limit the life of the tag though. Fouling (growth of organisms on the surface) is an issue causing the sensors to get clogged and prevent signals being sent. In other cases, other animals have been known to bite off the aerial. Eyes in the sky aren’t cheap! Tags range from roughly $USD1700-$5500 ($2000-$7000 AUD), depending on what features you require. The costs don’t end there though. We also need to pay for satellite time and processing, which is based on the number of detections. While satellite telemetry is now the most commonly used technique to study long-distance migrants, accuracy on the locations can vary, depending on the quality of the signal. Transmitter positions are qualified by Location Classes (LC), and range in decreasing accuracy from 250m to between 1-10km. Class Z indicates positions are highly inaccurate, and these detections are normally removed from the analysis. We don’t like Class Z. If Global Positioning system (GPS) tags and satellites are used, accuracy can be much higher; however, they are more expensive and have their own set of drawbacks, including reduced battery life. PAT tags. For animals that don’t visit the surface. All is not lost for animals who choose to remain at depth. We can still use satellite technology to follow the movements of animals that do not break the surface. Pop off archival satellite transmitters (PAT tags) are programmed to collect and archive data such as depth and temperature before the tag releases from the animal at a pre-programmed time (e.g. 6 months). 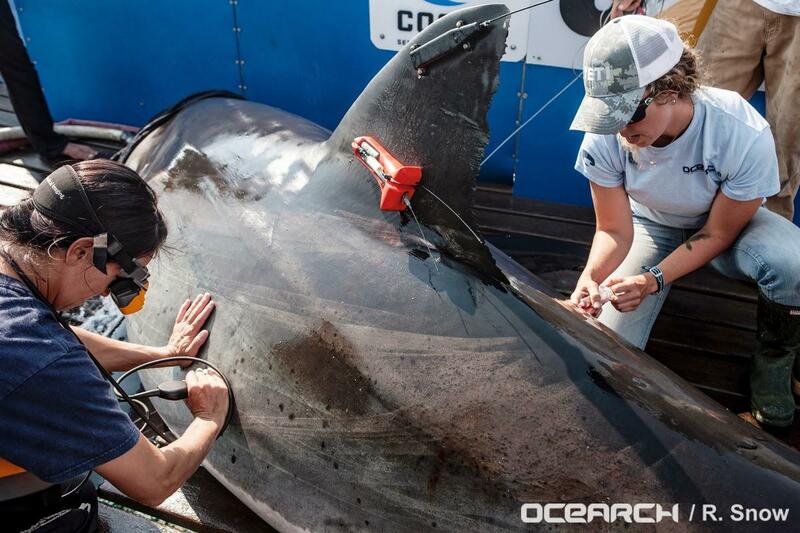 When released, the tag floats to the surface and the position of the release location and archived data are sent to satellites passing overhead. 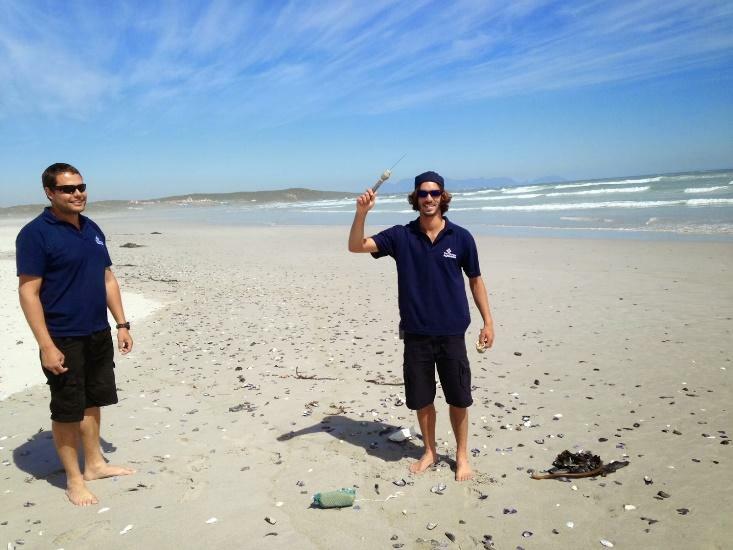 Here is one of our PAT tags found on the west coast of South Africa after popping off a seven gill shark. These tags can contain loads of data, but satellite bandwidth is limited. To ensure the data transfer is economical, the archived data is collated into predetermined groupings (called bin data), essentially summarising the key points of interest from a large data set. However, if the tag can be found once it has floated ashore, the data retrieved directly from the tag is like gold. The tag can be programmed to collect data near continuously, giving information at a much finer scale than the information relayed via the satellite. This image compares the 2 information types from PAT tags. 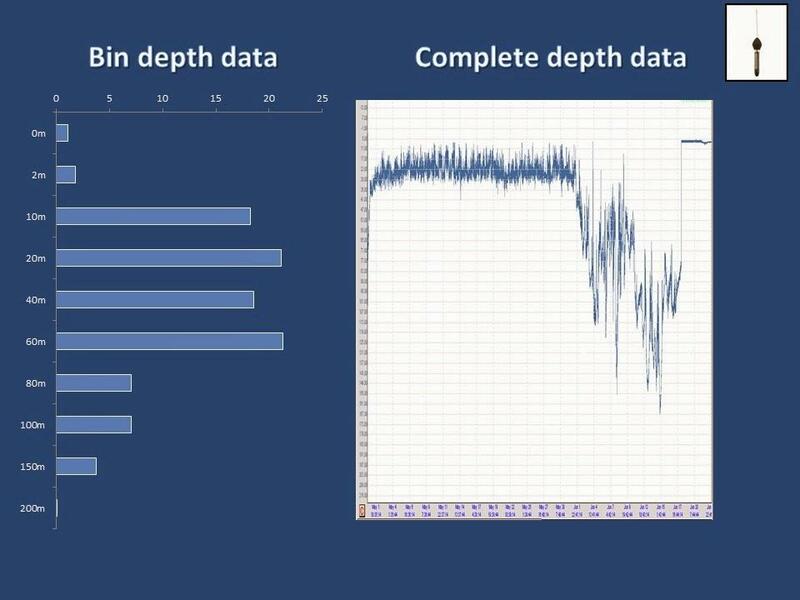 Bin data (on the left), which is retrieved remotely, does not have the same level of information as the recovered tag information (on the right). Thousands of marine animals are being tracked by researchers worldwide, just waiting for the next ‘hit’ to come through on the whereabouts of their individuals. With the price so high and the opportunity to tag an animal so fiercely fought, it can be a very anxious waiting game. But it’s all worth it in the end. The information we gain using this technology is incredible and is progressing rapidly. Mapping previously unmappable movements of some of the ocean’s largest creatures is essential for their sustainable management and conservation.